Mike Sosnowski must have heard the footsteps. He has succeeded in getting his number one election opponent removed from the ward. 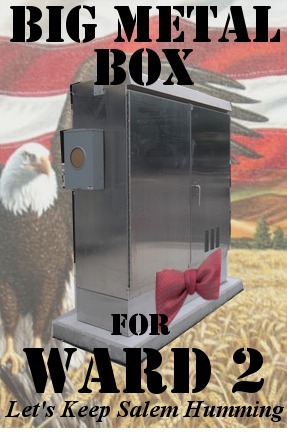 Ward 2-ers should still write in our metal friend. 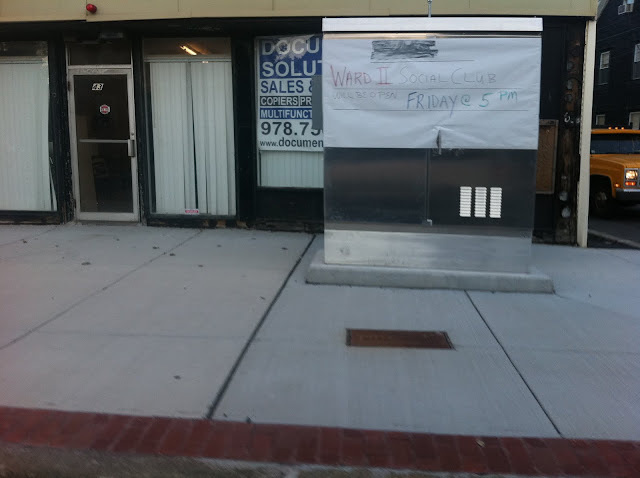 Paul Plecinoga tweeted this morning: Looks like Councilor Sosnowski can rejoice, the big metal box on the corner of Bridge & Planter st is gone, replaced by barrels & wires. I only have one question. When this came up, the state was very clear that it wasn't footing the bill for any changes. So I gotta ask, how much is this personal preference going to cost the city taxpayers for replacing the box and redoing the sidewalk in that spot? LOL! so, what's going to control the lights now? Maybe I'll print out banners to hang around the neighborhood to get people to join. I'm hoping to get some people interested with just an online presence first. NNnnnoooooo! Let's pour one out for Big Metal Box.